I am in the process of installing a pair of the Nanobridge M5 units as an IP network link between a transmitter site and the studio location. The path is relatively short, about 1.5 miles over mostly water. The main reason for this is to replace the analog phone lines used for remote control data and backup programming delivery to the transmitter site. One added benefit, we are also installing several IP cameras to keep an eye on the place. We purchased the Nanobridge system for $80.00 per side. The price is pretty good, but the configuration and testing is a bit intensive. There are many versions of these spread spectrum radios, some are licensed, some are license free. These are inexpensive, license free links that I would count on for short paths or use in non-congested areas. In congested areas, licensed (Part 101) links should be used, especially for critical infrastructure like STLs. Since I dreamed up this idea, I figured I should make sure it is going to work before recommending it to the powers that be. I have learned the hard way, almost nothing is worse than a failed project with your name on it. Better to over study something than to go off half cocked, spend a bunch of money, then realize the idea was flawed from the start. See also: Success has a thousand mothers but failure is an orphan. Looks pretty good. 300 MB/s bi-directional which is faster than the Ethernet port on the unit. This will be set up in bridge mode with pretty robust encryption. The transmitter site side is configured in the router mode, creating a second class A network at the remote site. Next step, configuring the units. The Nanobridge units were set up in a back to back configuration in the engineering room. Each end comes with a default IP address of 192.168.1.20. The units were several steps behind the latest firmware version, therefore the firmware was upgraded first. The default admin user, password, and IP addresses were changed. There is no greater security risk than default user and password. The wireless security feature is enabled using WPA2-AES PSK and a greater than 192 bit access code. The unit allows for any access code length up to 256 bits. With a key of between 192 and 256 bits, the number of possible solutions is between 6.2771 E 57 and 1.1579 E 77, which should be pretty hard to crack. By way of reference, a 192 bit password has 24 ASCII characters and a 256 bit password has 32 ACSII characters. The system requires an access point, which is configured for the studio side making the transmitter site stub network the station side. The access point is configured not to advertize its SSID, thus it should be transparent to anyone sniffing around. 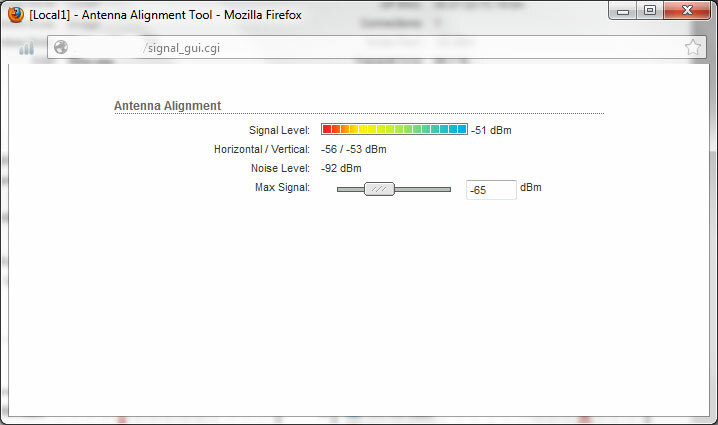 The WLAN is configured as a layer two bridge, which will cut down on the data overhead, as layer three framing will not need to be opened between the two units. 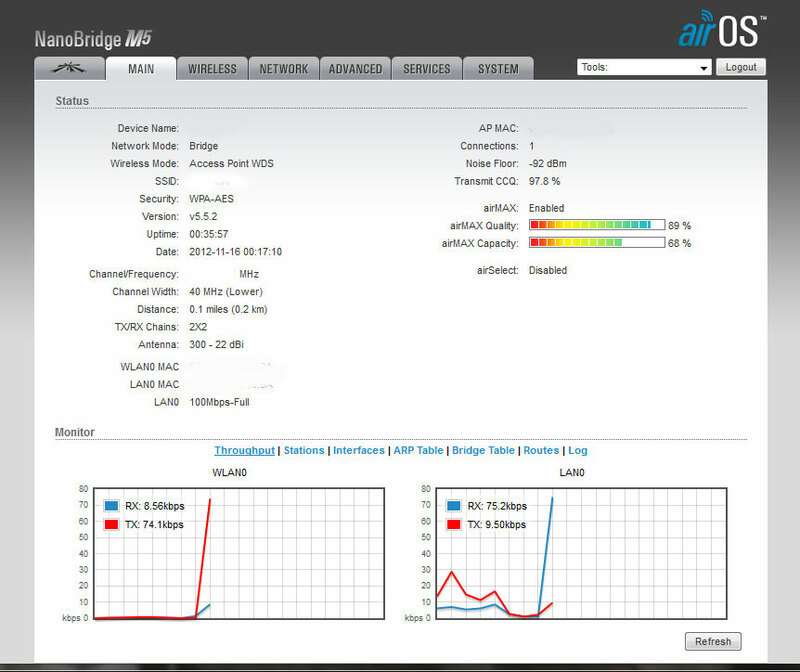 The transmitter site network is set up with SOHO router function built into the Nanobridge. 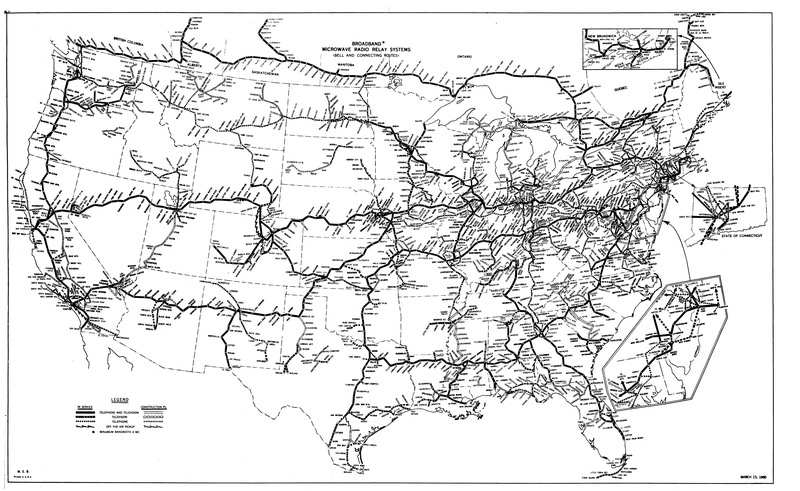 One static route is needed to get to the main network. Once the security cameras are installed, PAT may need to be used to access individual camera units via the public network. Next step, deploy the units and aligning antennas. These are 22 dBi gain antennas, which have a pretty tight beam width. Maximum transmit power is 23 dBm, or 200 mW. The transceiver/antenna unit has a handy signal strength meter on the side of the unit, which is good for rough in. The web interface has a more precise meter. In addition to that, there is a java based spectrum analyzer, which is very handy for finding open channels in congested areas. These units can also be used on UNii frequencies with special requirements. According to the manufacture, UV resistant shielded Category 5e cable should be used for outdoor installations. We have several spools of Belden 1300A, which fits the bill. 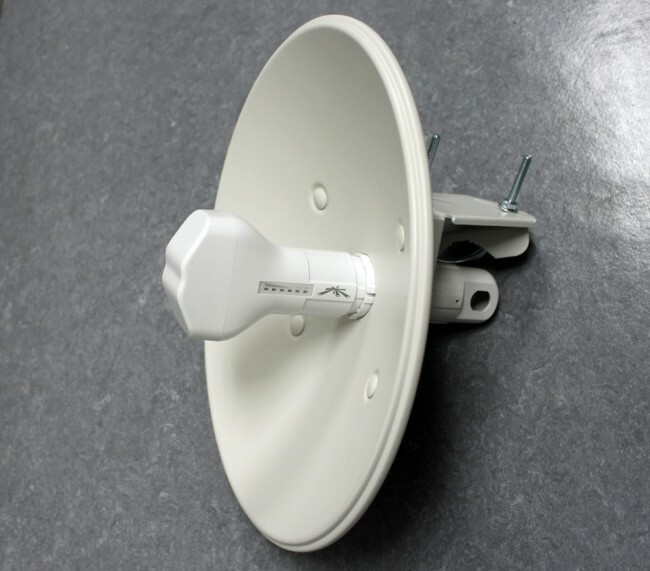 The shielded Cat 5 is necessary for lightning protection as the cable shield offers a ground path for the antenna unit. The antenna mounting structure is also grounded. I did not take the equipment apart to examine, but I believe the POE injector and antenna have 15KV TVSS diodes across all conductors. It will be interesting to see how these units do at the transmitter site, where there are two 300 foot towers which likely get struck by lightning often. More pictures of the installation when it is completed. Next step, put the system into service and monitor the link. At the transmitter site, a re-purposed 10/100 Ethernet switch will be installed for the cameras, computer, IP-RS232 converter and anything else that may need to be added in the future. 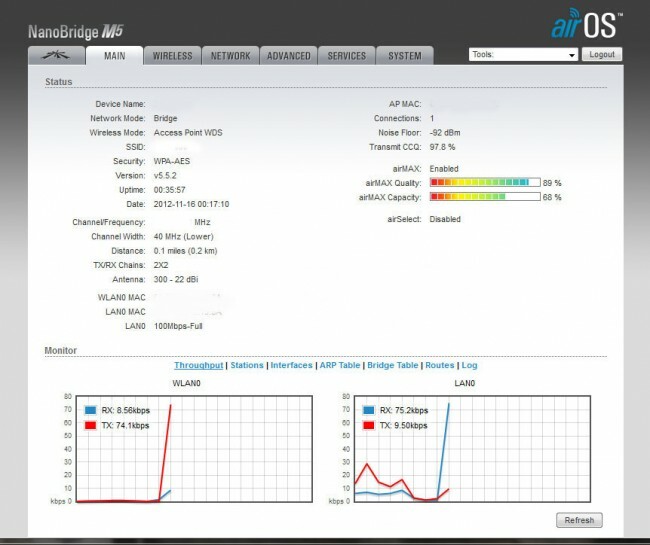 One thing we may try is an Audio of IP (AoIP) bridge like a Barix or Tieline for program audio and room audio. In this blog post about the NAB radio show, Paul McLane (Radio World editor) discusses the reduction of technical people in attendance at the conference. Consolidation has brought about many changes in the broadcasting industry, engineering has not been immune to these changes. Because of consolidation, engineering staffs have been reduced or completely replaced by contract engineering firms. Since the Great Recession of 2008-09 this trend has picked up speed. Expect it to continue to the point where large broadcasting companies employ one engineering staff administrator at the top, several regional engineering supervisors in the middle and the bulk of the work performed will be done by regional contract engineering firms. There is no reason to expect the media consolidation process to stop any time soon. It will continue in fits and starts depending on the congressional mood and the awareness or lack thereof of the general public. The NAB itself seems bent on removing all ownership regulations and eventually, with enough money spent lobbying congress, they will get their way. Thus, the majority of radio stations will be owned by one company, the majority of TV stations will be owned by another company and the majority of newspapers will be owned by a third. There will be some exceptions to that scenario; public radio and TV, privately owned religious broadcasters and single station consolidation holdouts. If funding for public radio and TV gets cut, which is very likely if the economy collapses further, they will be up for grabs too. National formats will be introduced. Clear Channel already does this somewhat with it’s talk radio formats. Look for more standardization and national music formats for CHR, Country, Rock, Oldies, Nostalgia, etc. These were previously called “Satellite Radio” formats but I am sure that somebody will dust of and repackage the idea as something else. They will be somewhat like BBC Radio 1, where a single studio location is used with local markets having the ability to insert local commercials if needed. Some “local” niche formats will still exist and major markets where the majority of the money is, will continue to have localized radio. Audio distribution will move further into the Audio Over IP realm using private WANs for larger facilities, public networks with VPN for smaller facilities. AOIP consoles like the Wheatstone Vorsis and the Telos Axia will become the installation standard. These consoles are remote controllable and interface directly with existing IP networks for audio distribution and control. Satellite terminals will become backup distribution or become two way IP networked. Cloud based automation systems will evolve. File and data storage will be moved to cloud base servers using a Content Distribution Network topology. Peers and Nodes will be distributed around the country to facilitate backup and faster file serving. Continued movement of the technical operations into a corporate hierarchy. Technical NOC (Network Operations Center) will include all facets of facility monitoring including transmitters, STL’s, automation systems, office file servers, and satellite receivers via IP networks. The NOC operators will dispatch parts and technicians to the sites of equipment failures as needed. Regional contract engineering and maintenance firms will replace most staff engineers in all but the largest markets. Existing regional engineering firms will continue to grow or consolidate as demands for services rise. Those firms will employ one or two RF engineers, several computer/IT engineers and many low level technicians. The most important skill set for broadcast engineers in the coming five to ten year period will be IP networking. Everything is moving in that direction and those that want to keep up will either learn or be left behind. Radio stations more and more revolve around networked computers. Engineers need to understand computer networking, especially as it relates to audio distribution and playback. Eventually, I see broadcast engineers being more computer science types rather than electrical engineering majors. What I have found out about computer networking is this: it is not rocket science. In fact, most of it is pretty easy. Physical networking and cabling is similar to audio and TELOC cabling. Automation computer servers themselves are not difficult to understand as most of them run on some type of windows program. Other servers such as Apache for WWW and for FTP and streaming run on some type of LINUX OS. LINUX is also not difficult to understand so long as one knows the right command line prompts. The first part of understanding computers is networking. Without a computer network, a computer is a glorified typewriter. Almost every automation system and or digital editor requires some type of network. 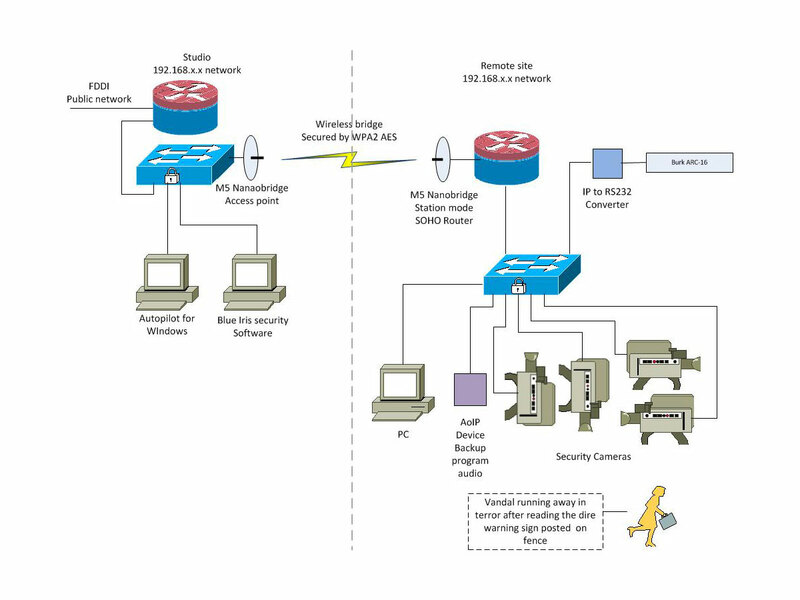 Consoles and computers that use AOIP require well constructed networks in order to operate properly. To that end; cabling choices, network interface devices such as switches and routers, patch panels and so forth need to be specified and installed with care. Most often, it is the simple things that will trip an installer up. The one area where I have found the most mistakes made is the pairs connection to various termination points. There are two basic standards, TIA/EIA T568A and T568B. Neither is better than the other, both are often identified on terminating devices such as jacks and patch panels. The most important aspect to these standards for an installer is to pick one and stick with it. 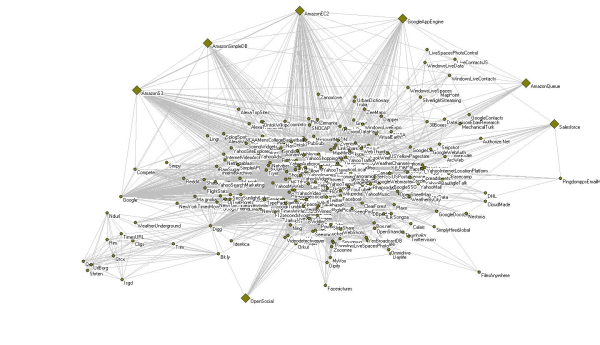 When certifying networks, the most common problem I have encountered is crossed pairs. Almost invariably, one end will be punched down with the A standard and the other with the B standard. Jacks are particularly difficult, as the color coding stickers show both. 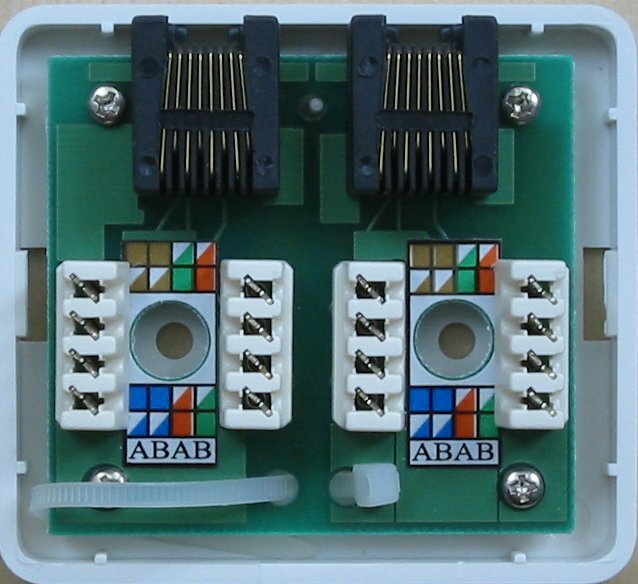 Many patch panels have a slide out, reversible card with is an either/or situation. 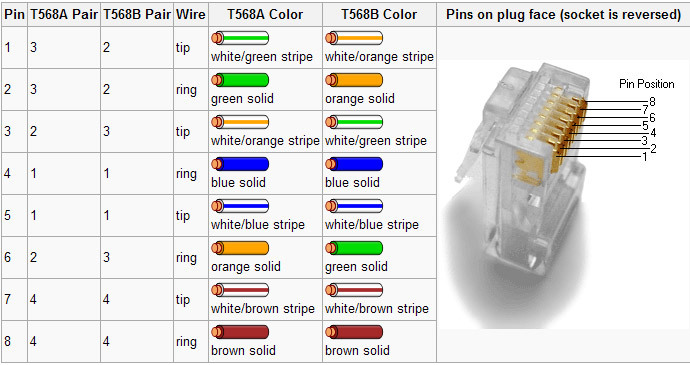 For some reason, I have stuck with the B standard and on any project I am managing, I get rid of all the A color codes I can find and tell the installers that B is the only acceptable termination standard. That cuts down on a lot of errors and redos during certification. That is good, it saves time and I hate redos. You can see that this color code marking can lead to confusion. I take a sharpie and cross out all the the A markings to avoid installation mistakes. Incidentally, on any new network installation, Category 6 cable should be used. As more and more data through put is required for network applications, Category 6 Cabling has better performance specs and will likely have a longer service life than other cable. It may be a little bit more expensive than Cat 5, however, well worth the investment. It would be a great mistake and waste of money to have to pull out the network and reinstall it in a few years because the cabling doesn’t have the required bandwidth. Category 7 cabling is in the works.